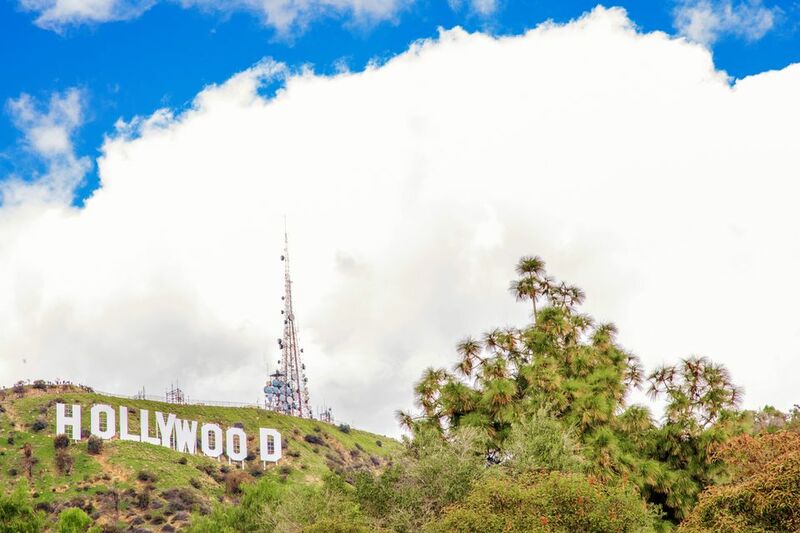 Everyone wants to see the Hollywood Sign when they visit Los Angeles, and it's easy to do. In fact, it would be hard to avoid seeing it as you drive around in the Hollywood area. That may be all you want. The Hollywood Sign is not lighted at night. It faces south and is visible during daylight hours only. You cannot walk up to it, but there are plenty of ways to get a look at it. If you want to see the Hollywood Sign from all angles, browse through these best shots. Seeing this iconic sign is undoubtedly one of the top things to do in Hollywood. Best of all, there's no charge for looking, so it's a top choice among people trying to save money during their trip to LA. You can't get close enough to the Hollywood Sign to touch it. It's fenced in to keep out vandals and curious visitors, guarded by a high-tech alarm system. If you get too close — and forget about the touching — you can count on being arrested. If you want to do something else after that instead of sitting around waiting to get bailed out, you'll have to be content to see it from around town. If you go to see the Hollywood sign by automobile, you'll find signs at the entrance to many streets. They may say there's no access to the Hollywood sign or that the street is closed. That's strictly true, but a bit misleading. Just because you can't access the sign doesn't necessarily mean you can't see it. You can take an easy hike that goes to a good view, but not all the way to the sign. There are no public restrooms on this route. Take care of "business" before you set out. Choose 3390 Deronda Drive, Los Angeles as your destination. Ignore signs that say there's no Hollywood Sign access. Also, ignore signs saying the road is closed. Technically, it is closed (it's a dead end), but that doesn't mean you can't continue to the end. When Deronda reaches a dead end, you'll see a metal gate on the right. Find a legal place to park nearby and don't be THAT person who blocks someone else's driveway. Not only is it rude, but local homeowners know (and will use) the phone number for the tow truck that will take your vehicle away. Look for an arched opening in the wall near the gate and go through the opening. From there, it's pretty easy to figure out what to do. Walk a short distance uphill to two spots for viewing the sign. The photographer who took this photo probably got to this location above the Hollywood Sign using the Hollyridge Trail. Unfortunately for you, the gate used to access the trail from Beachwood Drive closed permanently to hikers in April 2017. You can still get to the vista point above the sign using the Brush Canyon Trail, but the hike to the Hollywood sign using this route is 6.5-mile trek out and back. It isn't a walk you should try without good directions, which you can find at Hikespeak. The 3.5-mile walking loop around the Hollywood Reservoir may be one of the best short walks in LA. The mostly flat trail presents views of the lake and the iconic Hollywood sign along its entire length. The path curves through tree-shaded areas broken by open vistas. You might see a deer or hawk soaring overhead. Or get a view of Hollywood through the trees. The most common directions online recommend taking Barham Blvd to Lake Hollywood Drive. Instead, you can navigate to 6451 Weidlake Drive. Follow the road past that address to a small parking area near a gate. Start by walking across the beautiful Mulholland Dam, then walk around the reservoir or double back when you get half tired (if you can figure out when that is). From the Griffith Observatory parking lot, look for the James Dean bust with the Hollywood sign in the background. The observatory is where the ending scenes of Dean's film Rebel Without a Cause were shot. The unobstructed view of the Hollywood sign behind it is a good photo op, but you'll find a lot more to do at that location in the Griffith Park Observatory Guide. ©2006 Betsy Malloy Photography. Used by Permission. The view is nice from the intersection of Beachwood and Glen Holly. A block or so further up the street you can get a clear view between the houses. This view is from the Beachwood Canyon subdivision that the sign was initially built to advertise, back when it still said "Hollywoodland." The view is good from the intersection of Beachwood and Glen Holly. A block or so further up the street, you can get a clear view between the houses. Hollywood Forever is at 6000 Santa Monica Blvd. next door to Paramount Studios. To see the sign, go inside the cemetery gate and look behind you. Seeing the Hollywood Sign from Hollywood Forever Cemetery makes you wonder if the stars of yesteryear buried there get a permanent view of the word that defined their careers. When Frank Lloyd Wright designed Hollyhock House for the patron of the arts Aline Barnsdall, he broke one of his cardinal rules that a house should never sit on top of a hill. Given the vistas from Barnsdall's land, it's easy to see why. This view of the Hollywood Sign form that hilltop shows what the sign's surroundings look like. Hollyhock House is at 4800 Hollywood Boulevard. In the heyday of silent films "Gower Gulch" was a popular hangout for unemployed movie cowboys. The view is nice, but it's not good for a photograph because of utility wires running across the street. If you want to go, set your GPS to 1900 N. Gower St. The Hollywood at Highland shopping complex frames several nice views of the Hollywood Sign. Behind the main courtyard in front of Starbucks, you can get a nice "I was there" shot with you and your friends on an oversized casting couch. Find out more about this spot in the Hollywood and Highland guide. From Mulholland Drive, you can see the Hollywood Sign and most of the Los Angeles area on a clear day. In general, this view will be better in winter. This route may sound like it connects to the Hollywood Reservoir route above, but it does not. Mulholland Highway and Mulholland Drive are not the same. To get to this view, take Highland Ave north past the Hollywood Bowl, turn onto Cahuenga Blvd which parallels U.S. Highway 101 and when you get to Mulholland Drive, go uphill. Continue until you see a small overlook and parking lot on the left. Walk up the steps to get the panoramic view.